Periodically to take a break from sitting and writing, I get out of the recliner and hike up the hill to spend a little time puttering in the barn. I am getting much faster at writing over time — I penned the thousand-word introductory essay for the new l’Art du Menuisier: The Book of Plates in about two hours, but still it is simltaneously exhilarating and tedious. Since I know I have to get back to work to stay on track, my times in the barn are short and the activities brief and episodic for several more days. In addition to periodically loading the solar wax melter to purify more beeswax I grab a scrub plane to continue the flattening of a maple slab I glued up several winters ago. 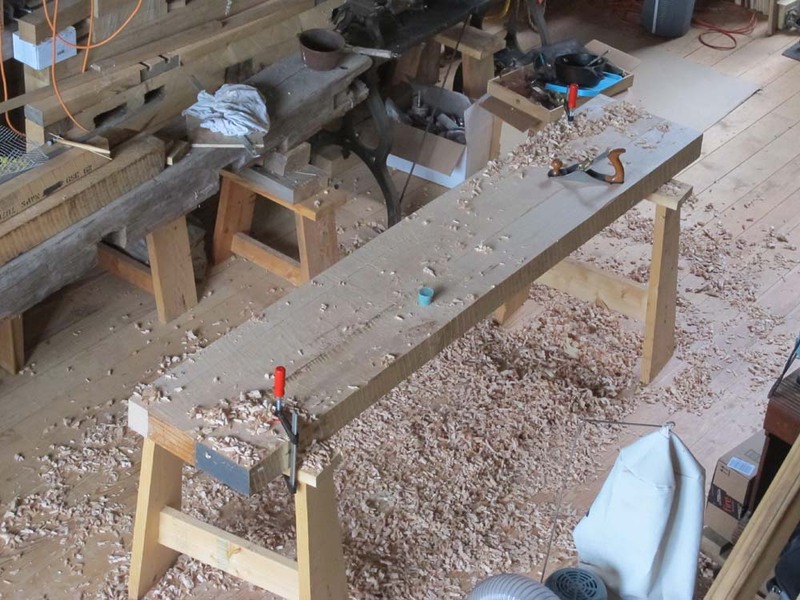 It is destined in short order to become a Roubo-hybrid bench in my barn studio, perhaps even under the east bank of windows. The “hybridization” of the bench will be in the form of another Emmert K1 vise, a tool I consider unsurpassed in the bench world. The 18″-wide maple slab was out-of-flat by more than a quarter inch and I do not own a power planer that large and the darned thing is just too heavy to take to a friend’s shop where a planer that large sits. A few minutes of scrubbing here and a few minutes of scrubbing there adds up, and now the slab is flat enough to start laying out the legs. Ten feet away my old Roubo bench I built for my conservation studio at the Smithsonian, where the climate control was perfect all theim time, developed a 1/2″(!) crown once I moved it to the unregulated environment on the south side of the barn. I will also will be taking a whack at that as a vigorously physical respite from writing. Another fortnight or less and the first draft of VIRTUOSO will be done.